chris, a retired police officer, lost his leg as a result of a runaway staph infection that was set off by a bug bite, of all things (compounding on previous injuries sustained on the job). so, that’s horrible, and gives me something new to worry about that i wasn’t previously worried about. as chris’ amputation was above the knee, he found that the prosthetics offered to him never quite fit right, never stayed put and caused considerable discomfort. after several years he ended up as a candidate for a relatively new technology called osseointegration, performed at cedars sinai hospital in los angeles. in this procedure a metal rod was surgically attached to his femur, with a stud protruding from the skin. this allows him to attach the new prosthesis in a way that is secure and doesn’t rely on suction. added to that, the range of motion is far greater and more comfortable. he can even cross his legs again. on an unrelated note, i understand the shoes (to keep the height level consistent from side to side), but the sock on the prosthetic always seemed unnecessary to me. is it just a symmetry thing? kathy is a cancer treatment success story – something that will hopefully become so commonplace it will barely warrant mention. at this point she’s more than five years free of lung and liver cancer, fought off by new immunotherapy treatments. these treatments use the body’s own immune system to target the tumors and in some very fortunate cases have spectacular success. there’s a long way to go still on the research, but every new case provides more data and better understanding. jon gutman is a previz animator and layout artist at dreamworks whose credits include the how to train your dragon and kung fu panda series. there’s something undeniably exciting about going to the dreamworks campus. unlike what i usually do, these guys get to make worlds out of whole cloth, and it all starts with previz. not limited just to animation, a previz artist will sketch out basic action and composition as a framework before principal photography even begins on a film. think of it, perhaps, as a very advanced form of storyboarding that moves. the idea was originally to shoot him with some iconography from one of the films - ideally, how to train your dragon. since the walls were basically covered with materials from movies currently in production showing any of the dreamworks office environment (or, any interesting part of the environment) was off limits. we were able to poke around the merch closet and came up with this little stuffed doll of toothless, the dragon. there were a handful of much larger figures but those were also off limits for us to move and handle. so, little toothless the stuffed animal it was. . . a bit of gaffer’s tape had him sitting nicely on jon’s shoulder. later on the magazine had the idea of replacing the toy dragon in photoshop with a drawn version, but this was quickly shot down by dreamworks PR as they didn’t want it to seem like the actual character from the movie was so diminutive. wanting to make something a little more fearsome, but still playful, we tried toying with shadows - shadows that were surprisingly difficult to get in the right place. to his credit, jon was amazing. he totally played up the shtick and it was great. if only every subject would be so involved in the process. we finished up with a little love for the giant kung fu panda in the dreamworks courtyard, just in case dragons weren’t the editor’s jam in the end. 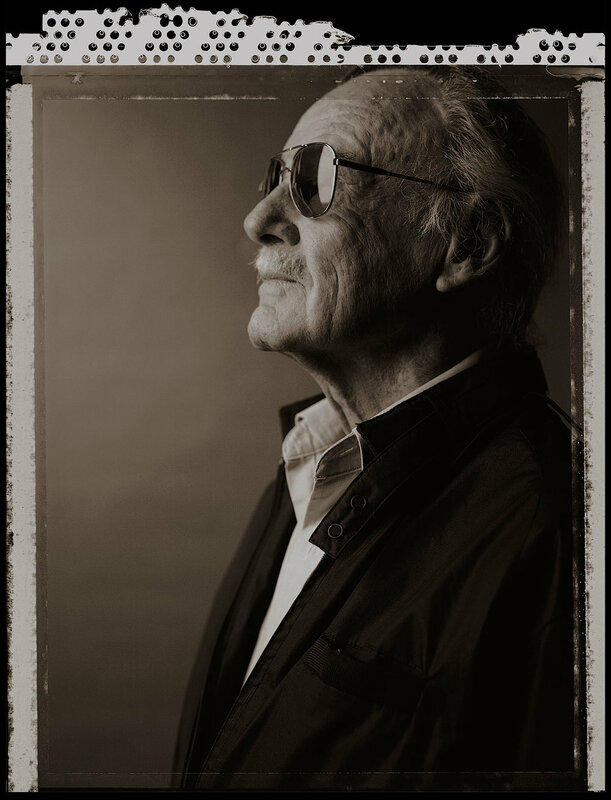 today is veteran’s day, november 12th, 2018 - the day stan lee died at the age of 95.
for a certain type of kid - the type of kid i was - growing up in the 80s, (and for other kids growing up in the 90s and 60s and 70s) stan might have been as influential a figure in my life as any of my friends or even my parents. stan took the fantastical things we were drawn to and grounded them in a depth that no one before him thought they deserved. i grew up collecting and admiring stan’s work, never thinking how silly capes and tights really were. even when i became an adult these things still mattered to me. i never cared much for sports, but the closest corollary i had was the way my friends and i would discuss superheroes. like sports, it’s all just a little silly and semantic. but our teams were our teams. and stan was the general manager. the first time i photographed stan lee (in 1997) i was as green and wet behind the ears as could be. i was trying to be fancy, using an old speed graphic 4×5 camera that i barely knew how to operate. i got everything set up and the moment stan arrived the camera decided to break. i was sweating bullets, in my twenties, in the office of the man whose ideas formed the foundation of the happiest, nerdiest times of my teens and i had just blown it. he let me come back the next day and things went a bit better. a few months after that i received this note (below) in the mail from stan. i had sent him a print of the photo and i was beyond thrilled to get an actual note back. four years later (2001) i shot him again, this time at his house, shortly before christmas. he didn’t remember me at all. the house was veritably overrun with christmas decorations. it seemed like every square inch of the place was covered with tchotchkes (or whatever the gentile term might be), all except for stan’s office, which simply had a lamp in the shape of spider man. the equipment worked then, but i mentioned to stan that once we were done i could have it all cleaned up and loaded out inside of ten minutes. he sat in the chair where i photographed him and timed me with a stopwatch, calling out the minutes as they flew by. i made it out with a few seconds to spare. i was never quite satisfied with that picture, but really pleased at the experience. sometimes that’s what you’re left with and that’s okay. all i could find of it on my computer tonight was this one low res film scan. we’re so far into the digital world now that i’d have to go dig through boxes of proof sheets in my garage to find something else. i photographed stan for the third time in 2013, for a spread in the “hollywood issue” of elle men, china. i felt better going in this time. i knew stan looked great. i knew he’d be wearing his trademark sunglasses, but if i lit him all right i’d be able to see his eyes. i knew i wanted to shoot him in color on a white background and in black & white on a black background. i knew how i wanted the spread to look, and i knew my equipment worked. i even found a copy of wolverine #1 in my garage, from 1988, in case the generalissimo felt like autographing things. the only hiccup this time was that we had to set up in the smallest possible office space, around an intern’s desk, even. still, we made it happen, stan was as gregarious as ever and – as expected – didn’t remember meeting me. i showed him the photos i had taken of him previously and he was polite enough to pretend to recall the episodes. it’s a great privilege to be able to revisit the same subjects over a period of many years, and an even greater privilege to be able to revisit a subject who had had such a profound impact on me growing up. making the pictures sing is – dare i say it – a great responsibility, too. it’s heartbreaking that he was wrong that time. i was really counting on it. excelsior, generalissimo! you were a force, and you will be missed by many. journalist peter arnett, photographed for stern magazine - this is an older shoot from february of this year - took a while to get around to being published. 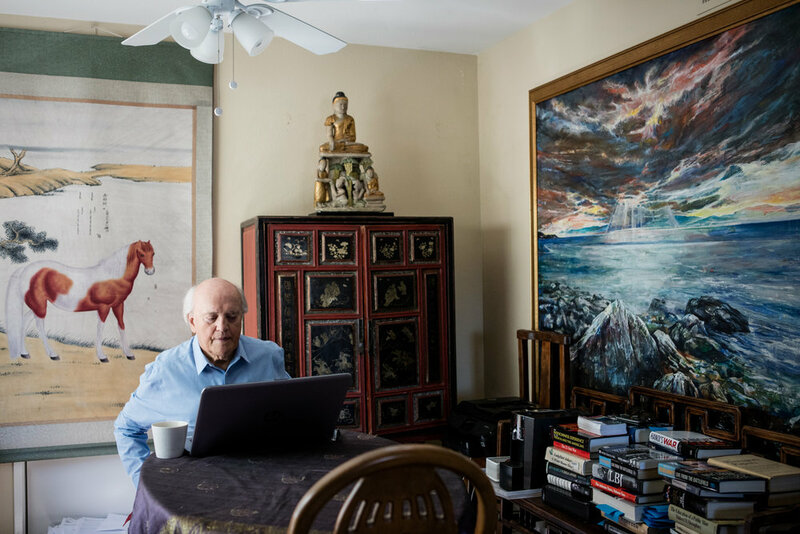 i photographed peter at his home in fountain valley, calif.
peter, now in his eighties, was a journalist for magazines and television, mostly covering war zones and conflict around the world, beginning with vietnam. he is most well known as being the first western journalist to get an on-camera interview with osama bin laden, for CNN in 1997. this is definitely worth watching as it eerily foreshadows the september 11th attacks. as luck would have it, a second netflix comedy special that i worked on was released this month, too: tig notaro's happy to be here, out on may 22nd. this was planned and pulled together very quickly - shot in early april, out less than two months later. the shoot itself was . . . odd. i have long had a great amount of sympathy for those who are uncomfortable being photographed. i pride myself on being fairly good at putting nervous people at ease and making the experience as pleasant as it can be. in this particular case there were very particular restrictions placed on what i could and couldn't do during the shoot, and the interactions between tig and myself. that's pretty much all i can say, except to say that it's not anything i've ever run across in over two decades of photographing people. still, here are a handful of out-takes that i liked, below. this month i'm excited to see the release of two netflix comedy specials for which i shot key art. first up, released on mother's day is ali wong's second stand up special, hard knock wife. this time around ali was decidedly less pregnant than on our first shoot for baby cobra. on that one we actually shot the artwork less than two weeks before she gave birth. this time i believe she was only seven months pregnant when she wielded boxing gloves, a sword, nunchucks and a baseball bat to produce artwork for hard knock wife. it's always fun to drive around the city and see billboards and bus stops with my photos on them. many thanks to ali for having me along on this one!